AutoCAD software, a product of Autodesk, is one of the popular software for creation of 2D and 3D drawings. Marketed by the label of Autodesk Inc., it is used majorly for making designs and drafting purposes. Not surprisingly, CAD in AutoCAD stands for computer-aided design (CAD) and drafting. The initial version of AutoCAD was Interact which only contained minimum features such as drawing as lines, circles, construct complex objects, polygons, arcs and text. The latest version of AutoCAD has graduated to a new level of 3D rendering and has a plethora of features compared to its first version. The latest version of AutoCAD is 19.1 or called AutoCAD 2014 – 28th release. It supports various versions of Windows operating systems such as Windows XP, Windows 7, and Windows 8. It continues to support file type and formats AutoCAD 2013.dwg. AutoCAD 2014 includes Design Feed, Autodesk Live Maps and others features. The latest version supports different languages such as English, German, Spanish, Chinese and others. All features of AutoCAD 2014 software can be easy to comprehend thoroughly by enrolling in an authorized CAD center in Noida, such as Multisoft Systems which provides official and updated Autodesk courseware. More importantly, Multisoft Systems executes a practical approach for training. To elaborate in addition to training, it also makes candidates work on projects so that they can explore, understand and apply all features of AutoCAD 2014. Above all, candidates cannot sit for Autodesk certification exams unless they have undergone training from an Autodesk Authorized Partner. 1. Multisoft Systems has been authorized by Autodesk (also known as Autodesk Authorized Partner) to offer high quality training of AutoCAD 2014. 2. Autodesk Certified AutoCAD Specialists are called for conducting training of AutoCAD 2014. 3. 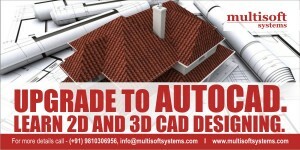 Autodesk Official AutoCAD Courseware is provided. 4. Licensed and latest version of AutoCAD software is only used. 5. 24 x 7 access to e-Learning portal and 24 x 7 email support. How does Altair’s HyperMesh software leverages meshing techniques with the help of FEM?